This time of year it’s customary to look back over the year that’s passed, and perhaps at the same time project forward over the year to come. The year that’s gone has probably seen the biggest changes in a single year in the history of the UK private rented sector (PRS); such a landmark needs recording. I tried my best to summarise the changes in my last opinion piece in our November Newsletter here: What a Year it’s been for the Private Landlord! Forecasting is a dangerous game and few so called experts ever get it right, witness Brexit and the Trump election victories. However, I think we can safely say that if we base our opinions on solid research, then we should be half way there. Thankfully we are helped in that regard by a brand new piece of detailed research carried out into the landlord and buy-to-let market on behalf of the Council of Mortgage Lenders (CML) by Kath Scanlon and Christine Whitehead of the London School of Economics. This is a fascinating piece of work based on one of the largest and most detailed regional PRS surveys ever undertaken in the UK, and I think it’s about the most up-to-date and accurate picture of the UK residential letting market it’s possible to get. The outcome is a report concluding that private sector individual landlords, whether these are landlords with buy-to-let mortgages or without a mortgage, are adopting what the authors term an “even keel” mentality in the face of some substantially negative regulatory changes; taxation, buy-to-let mortgage lending controls and some challenging new tenancy management legislation. 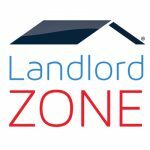 Are some landlords being myopic? In some cases this “even keel” mentality may be misguided and based on ignorance, particularly of the swinging tax increases coming in over the next 4 years imposed by the Osborne Budgets last year – see table below. As the report says, a fair proportion (around a quarter) of private landlords are operating on a “need-to-know” basis, that is they only find out about taxation changes and other letting rule changes when it affects them, and oftentimes, that’s just too late. A hugely stabilising factor in this, and one of the salient points in the report, is that around half of all landlords have no mortgage debt at all. For these landlords, the most financially threatening changes, those pertaining to mortgage tax relief, will be little affected, if at all, whereas the one-quarter of buy-to-let landlords with the largest portfolios, and the highest incomes, will be negatively affected. In some of the worst cases their annual income from their buy-to-let portfolios will turn into a loss, when the tax is paid. The conclusion for up to 20% of landlords is that the government’s targeted measures aimed at buy-to-let landlords may impose significant burdens on these individuals – and in the main they are individuals as opposed to limited companies – without necessarily having a great effect or influence on the behaviour of the private rented sector as a whole. In other words, many of the changes introduced by George Osborne could have unintended consequences, and ironically will hit those landlords who tend to operate at a higher professional level, operators the government has said it wants to encourage. There has been a concerted move by a minority of landlords to use companies to shelter their buy-to-let properties from tax, either by transferring existing properties into a company, or dong this with new purchases. Incorporation has its merits for some, but there are many complications. The pros and cons of every investor’s own situation need careful consideration and expert advice, and many experts feel there is little advantage in doing this, plus there’s always the risk that HMRC will be changing the rules again. In fact there are plans in train by government, as announced in the latest Budget, to change the entity rules for small companies. To my mind, some fascinating statistics emerge from the study. According to Scanlon and Whitehead 2,500 landlords, some 49% of respondents owned all their property outright, having no mortgage debt at all. This, they said, was an unexpectedly high figure given that a previous government figure had estimated this to be around 23%. However, those with buy-to-let mortgages tend to be younger, manage their properties more professionally, have higher non-property earnings, and hold larger and more valuable portfolios than other (non-mortgaged) landlords. 47% of the total number of rented properties in the survey had a buy-to-let mortgage. Among the buy-to-let landlords (those with mortgages), over half had loan-to-value ratios on their total portfolio of below 60%, with only 1% reporting loan-to-value ratios of over 90%. Some 62% of the sample of landlords interviewed own only a single rented property, with buy-to-let landlords more likely to have a multi-property portfolio than other landlords. Just over half of buy-to-let landlords own more than one property, with the overall average size of a buy-to-let portfolio being at 2.7 properties – this proportion sits in the tenth percentile of all landlords. 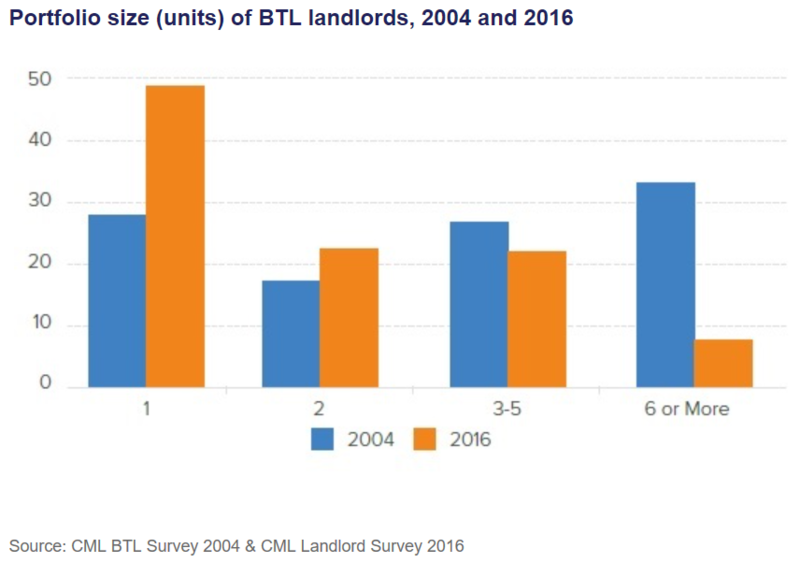 However, there has been a marked shift towards smaller portfolios among buy-to-let landlords since the last time the CML undertook a similar survey in 2004, as the chart below shows. The age profile of landlords somewhat reflects that of the home-owner population as an aging “baby-boomer” generation. The shift from 2004, to date has been quite dramatic: then only 24% of landlords were aged 55 or over, whereas now 61% are. On the other hand, what the report calls buy-to-let landlords (those with mortgages) are typically younger than the other cohort, but only moderately so. The authors put this down to the rate of at which new investors coming into the BTL sector is slowing down. In 2004, 18% of buy-to-let landlords had bought their first property within the last two years, compared to only around 7% today. In terms of a profile of a UK landlord: they will typically own rental property close to their own home, and are just as likely to manage their property themselves (50%) as to use a managing agent. Their motivation to become a landlord in the first place would revolve around the need for a pension, an investment for future capital growth, a regular income to supplement their earnings, and in preference to other forms of investment which currently offer poorer returns. Something like 66% of the private landlords in the sample gain less than 25% of their household income from rent, whereas around 5% or 1 in 20 said they made a good full-time living from being a private residential landlord. In terms of incomes, the median (middle) gross annual rental income was around £7,500, but the mean (average) was £17,300 as those landlords with very high rental incomes skewed the distribution. About 33% (one-third) of the landlords sampled earned a gross rental income equating to renting out a single property for between £416 and £830 a month. Nearly 25% (one-quarter) of the landlords surveyed started out as landlords by accident, (the proverbial accidental landlord) due to various circumstances such as renting out their own home when moving away, and around 14% started when they originally wanted to provide a home for a relative or friend. 30% (one-third) of the landlords questioned offered agreements lasting longer than 12 months on at least some of their properties, while the rest say their tenants don’t demand longer terms. What of landlords Future Plans? Most landlords seem to take a long-term view regarding their investment properties, and many have been active in landlording for decades. Currently, in contrast to previous years, there appears to be only a small inclination or desire in most landlords – whether a buy-to-let landlord (mortgaged) or not – to either increase or decrease the size of their property holdings over the next five years. Yet there appears to be an underlying trend or drift towards a modest disposal plan for some of their holdings. Certainly, it would appear that more landlords currently expect to reduce their property portfolios in the foreseeable future than to increase them. In is expected that over the next 12 months a net 6% of landlords will reduce their portfolios, while over the next five years this net figure is something like 14%. On the other hand, the buy-to-let landlords seem slightly less inclined to divest, with equivalent figures for mortgaged landlords at a net 5% over the next 12 months and 11% over the next five years. Generally, the reasons given by landlords for looking to reduce their property holdings were as part of a loner term planned exit. Only 21% of landlords cited tax changes as part of their reason to dispose of properties. 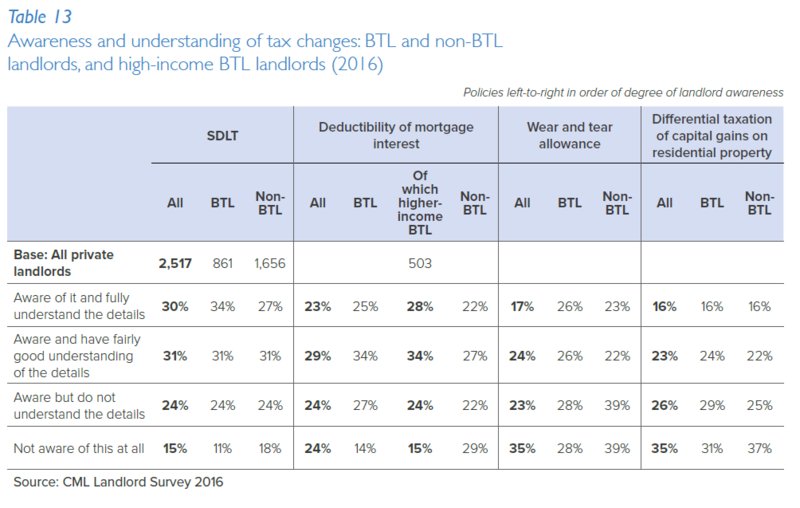 Not surprisingly, however, among those landlords with mortgages, tax was a prominent factor in their decision making. 36%, of these said taxation was the reason, compared to only 13% of the non-mortgaged landlords. Overall awareness of the various tax changes was extremely variable (see table 13 from the report below). As usual in the diverse and widespread landlord community, with the tax changes as with all legislative changes, news travels slowly. It can take years for some to catch up on these changes; we are still seeing numerous landlord falling foul of the deposit protection rules some 9 years after their introduction. With the introduction of a whole raft of new rules last year this level of ignorance and behaviour is not going to be good enough if a landlord is to run a profitable business. Whether through ignorance or foresight, the great majority of landlords expect their net income to stay the same or increase slightly over the next five years. However, 16% of buy-to-let landlords expect to see their income fall. When asked to say what their main coping strategy would be if their cash flow position worsened, only 16% and 12% of landlords said this would be to raise rents for new and existing tenants respectively, suggesting that many landlords will look for other options before choosing to raise rents. While the overall findings are encouraging and offer a reassuring picture of relative stability, there is a certain irony in the researchers’ conclusions that the landlords who will be most affected by the government’s tax changes are those at the most professional end of the sector – those with large, leveraged portfolios. These landlords will be particularly hard hit by the changes in the treatment of mortgage interest and may choose to divest or moderate their property holdings. Given the government’s longstanding interest in professionalising the sector, policymakers will need to be closely attuned to the risk of unintended consequences and, indeed, own goals. As we sit and await a clearer picture to emerge over the Brexit vote legal challenge and what is to follow, the triggering of article 50 and the Brexit negotiations, it is impossible to say with any certainty how the UK economy and in particular the property market will be affected next year and beyond. Will immigration controls be so tight they will affect demand for private rental and student housing? Will the Chancellor see sense and relax some of the worst aspects of the landlord taxes? Will the increase in institutional investment in rental property, particularly in the student market, affect the small-scale private landlord to any great degree? Answers will emerge all in good time, in the meantime we can be certain that given the size and importance of the buy-to-let rental market (the PRS) in the UK, the dire need for and the severe shortage of housing in some regions, and the paucity of returns in other forms of investment, buy-to-let can be profitable using the right strategies and proper management. We wish all our readers a Very Happy Christmas and a prosperous New Year.